CES, the undisputed big daddy of tech fairs anywhere in the world, lived up to the high expectations of the very demanding geek crowd this year too. While there was an entire range of innovations, it seems like televisions from major brands such as Panasonic, Toshiba, Samsung, Sony and LG stole the show. At CES 2013, it was evident that more players were jumping into the 4K race and even coming up with new OLED television models. The real innovation in this space was the first set of curved OLED screens displayed by Samsung and LG. A look at the curved OLED televisions and other stunners from the show. Amidst all the noise about 4k, OLED and 4k OLED, Samsung announced the curved OLED TV at the CES 2013. Simultaneously, LG announced its curved OLED 3D TV. The curved displays provide true equidistant viewing to the corners as well. Samsung has finally announced a new series of flexible displays for mobile devices. The company, which showcased its prototype Youm, believes flexible displays can bring out better colours and contrast with a super thin form factor. At the Samsung keynote, the company executive showed a phone that has one of these displays bent around the side of the phone, so that one can see the updates on the sides. The prototype Computer Graphic Watch from Toshiba has changeable dial images. It has high performance ARM SoC supporting realistic graphic display. The smart functionality includes connectivity with Android smartphones or the iPhone. Once connected, the watch can be used for alerting for incoming calls, emails and calendar scheduling. According to Toshiba, the watch can be used to navigate with the smartphone GPS or display news or weather update as well. There was also an ECG enabled sensor on the watch that recognises the owner's unique pulse pattern. Interestingly, if the watch fails to recognise the pulse, the smart functions gets disabled. Following up on the success of its Snapdragon S4 chipset, Qualcomm has announced the next generation 800 promising impressive speeds of 2.3 gigahertz. The new chipset is already being designed into dozens of new phone models. Even Nvidia announced Tegra 4, claimed to be world's fastest mobile processor sporting 72 cores. 'Audi Connect' services now bring 4GLTE wireless connectivity powered by Gobi multi-mode 3G/LTE chipset from Qualcomm to the A3 family car. Audi Connect will offer in-car Wi-Fi hotspot, Internet radio, Web services and an augmented navigation system that presents street-level visual imagery streamed to the vehicle. With the aim of accessing everything one has on the smartphone while behind the wheels, Ford has started a new open source SDK and developer program. The Ford Sync Partner Network will include voice activated control of the smartphone apps and utilising the sync communications and connectivity system. Nvidia Project Shield is a console-type personal gaming device with a 5-inch touchscreen and controller type buttons, triggers, dual joysticks and a single directional pad. 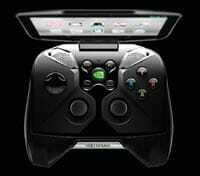 The device runs on Nvidia's new Tegra 4 processor and will have the Android Jelly Bean operating system. Users will be able to stream PC games directly to the device and even download games and apps from Play Store. The push for a bigger smartphone display has reached a new level with a 6.1-inch capacitive touch screen. The Huawei Ascend Mate has a 1280x720 resolution and is 9.9mm thick. It runs Android Jelly Bean and is powered by 1.5GHz quad core processor and has 2GB RAM. Other features include 8-megapixel rear-facing camera with HDR and a 1-megapixel HD frontfacing camera for video calls and 4050mAH battery. At CES, Sharp came up with the world's first 8K TV. The 85-inch prototype has a super high vision with 16x more resolution and has 7860x4320 pixels. Other features include 300 cd/m2 luminance, 10 bits for each RBG and UV2A LCD panel. The challenge for the 8K TV would be commercial availability of content. BenQ's Full HD short-throw video projector comes with a native resolution of 1080p and has 10,000:1 high contrast ratio. It is powered by 2000 ANSI lumens lamp. While the projector has 3D direct play and a 100-inch projection from just 1.5 metres away. The projector will also have 2HDMI ports, a built-in 10W speaker and will support multiple forms of 3D including Blu-Ray, 3D broadcasting, video games and NVIDIA 3D TV PC connectivity. Samsung's latest F8000 will have a quad-core processor for enhancing the Smart TV experience. According to Samsung, the F8000 LED TV will be 3x faster than Samsung's 2012 TV models. The TV will also have the best streaming video quality by supporting the HDVC video codec. Android cameras aren't news anymore, but an Android camera with interchangeable lens definitely is. 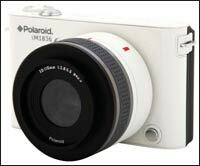 Polaroid's iM1836 has an 18-megapixel sensor and runs on Android Jelly Bean operating system. The camera will come with 10-30mm optical zoom lens and is capable of recording full HD videos. The camera even has a 3.5-inch display. Panasonic has not restricted its 4k technology to televisions. 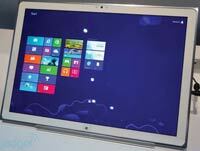 The company unveiled a new 20-inch 4k Windows 8 tablet. Designed for professional use, this tablet will be a part of the company's toughbook range. The tablet will have a 3840x2560 pixel resolution, Intel Core i5 3427U vPro 1.80 GHz; NVIDIA GeForce Graphics; HD 720p embedded camera and approximately two hours of internal battery usage. 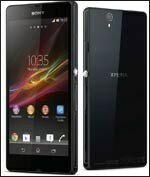 The only big announcement in smartphones was the Sony Xperia Z. With a full HD 5-inch retina display with mobile Bravia engine 2, the Xperia Z will be powered by powered by Qualcomm's Snapdragon Pro quadcore processor. It will also have a 13MP camera with the world's first image sensor with HDR for videos. It captures stunning images in the dark as well. With an eye on smart houses, Samsung unveiled a 32-cubicfoot four-door refrigerator equipped with a touchscreen LCD. The screen can run Samsung's proprietary Evernote app and other apps, allowing users to share photos, videos, and recipes with family and friends. Interestingly, it has the ability to change different compartments as needed. So for instance, more space can be made for freezing by changing the temperature of other compartments. Sony wowed everyone by announcing the world's first 4K OLED TV. The company displayed a 56-inch prototype with 3840x2160p resolution. The company has been able to produce this display using oxide semiconductor TFTs. The new OLED component's structure also incorporates Sony's own 'Super Top Emission' technology, which has been successfully incorporated in other products already introduced into the market. iPotty was a real showstopper at CES 2013. With kids fascinated by gadgets such as laptops, iPad and smartphones, this accessory gives them a something to play with while taking a dunk. 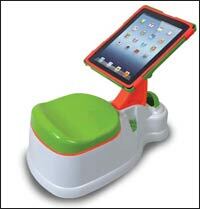 The potty seat with hold the iPad so that the kid can continue to play. Panasonic unveiled the all-new bone conduction headphones that don't need speakers or even your ear to transmit sound. These headphones use cheekbones to deliver audio straight to the head. The headphone connects to a TV via Bluetooth and is worn like normal headphones.